Is The Saudi Oil War Of Attrition Starting To Take It's Toll? Is The Saudi Oil War Of Attrition Starting To Take It’s Toll? Saudi Arabia is facing a hefty budget deficit due to the ongoing oil glut. After news this week that Saudi Arabia is planning to raise $27 billion through bond sales it may be a sign that the low prices of oil are starting to take their toll on the country. With concerns over Iran and other countries in the region, Saudi Arabia has also imported the latest military kit to warn off its neighbours however this type of spending is an expensive outgoing for a country whose economies budget deficit is expected to reach 20% of GDP in 2015. In addition to the flailing oil industry and political tensions in the region Saudi Arabia has an unemployment problem with two-thirds of its population being under 30 and the unemployment rate for the 16-29 age group is 29%. The country has already worked its way through almost $62 billion of its foreign currency reserves this year forcing it to borrow $4 billion from local banks in July and issue its first bonds since 2007. Saudi Arabia leads the Organization of the Petroleum Exporting Countries (OPEC), and after launching an economic oil war with the United States in November last year when it decided not to cut its production to avoid losing it’s market share it appears the country may not be able to sustain such significant losses for a much longer duration. It appears the country underestimated U.S. shale producers as they found new ways to extract oil cheaper which has allowed them to sustain their businesses without facing bankruptcy as originally expected. Whilst the number of US oil fields have declined, the production output per field has increased which many oil industry experts believe will allow US shale producers to cut costs by 45% this year. The only upside for OPEC countries is that US shale hedges are about to expire with some companies facing imminent bankruptcies however still this would not result in wells getting abandoned; it’s expected that they would then be acquired by much bigger competitors for a discounted price once again pressuring Saudi. As with many established oil-producing countries, Saudi has become accustomed an era of high oil prices. 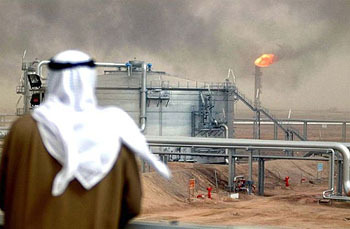 Kuwait and Abu Dhabi can get by with crude at its current level however Saudi Arabia is now involved in an expensive war of attrition which they aren’t guaranteed to win anymore.